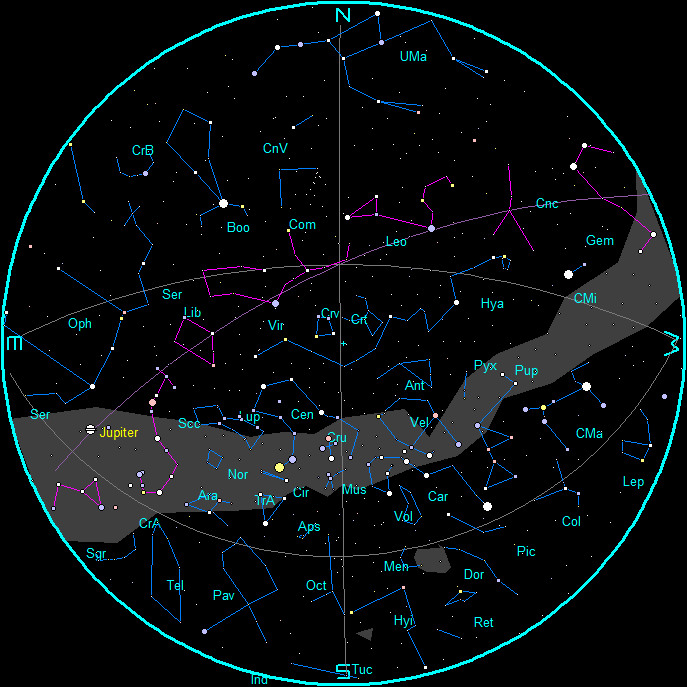 The charts contain the entire dome of the sky as seen from around 45 degrees north latitude and at the dates and times for the locations listed below. Planet positions are plotted for the 15th of the month. The moon is not shown. To track the planet positions at weekly intervals go to my Ephemeris Blog for my Wednesday posting at bobmoler.wordpress.com. For early birds I’m including a morning star chart too, which shows the stars we’ll see in the evening 4 months from now. If you want to convert the above times for your locality in North America click here. The outer edge of the chart is the horizon with the compass points marked. The chart is oriented as one is looking south. The constellation outlines in magenta are those of the Zodiac. The magenta line is the ecliptic, the path of the sun. The white line that passes through the east and west compass points is the celestial equator, above the earth's equator. The white lines that cross in the north at the north celestial pole are major right ascension lines and are like meridians on the earth. All constellations shown have the standard three letter abbreviation. Not all constellations are shown, faint and small ones were deleted for overall clarity. 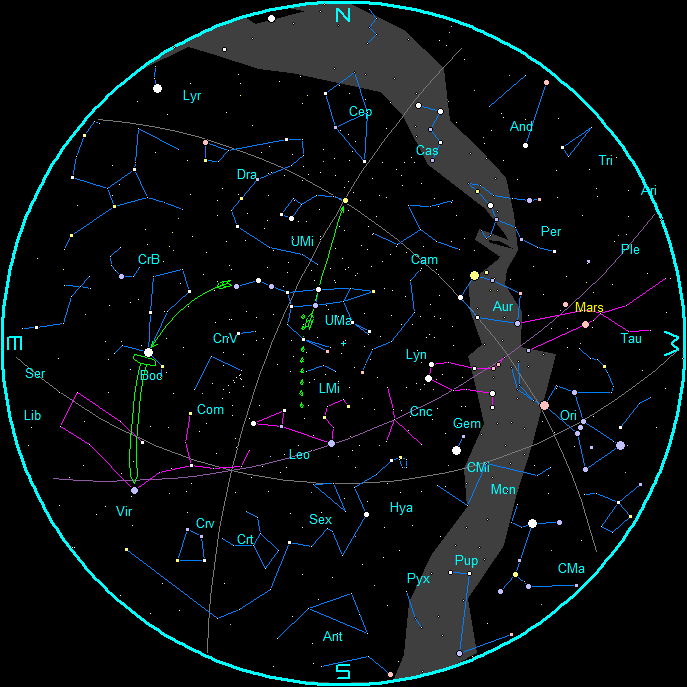 The constellation abbreviations, names and bright star names are found here. Also on the sky dome are helps to locate other stars and constellations from the Big Dipper, and asterisms. The arrow from the pointer stars of the Big Dipper to Polaris the North Star, near the north celestial pole. Follow the arc of the handle of the Big Dipper to Arcturus. Follow the spike to Spica. LyrR is the Lyrid meteor radiant. The shower reaches peak in the late afternoon of the 22nd. Best viewing time is between the end of twilight and moonrise just after midnight. 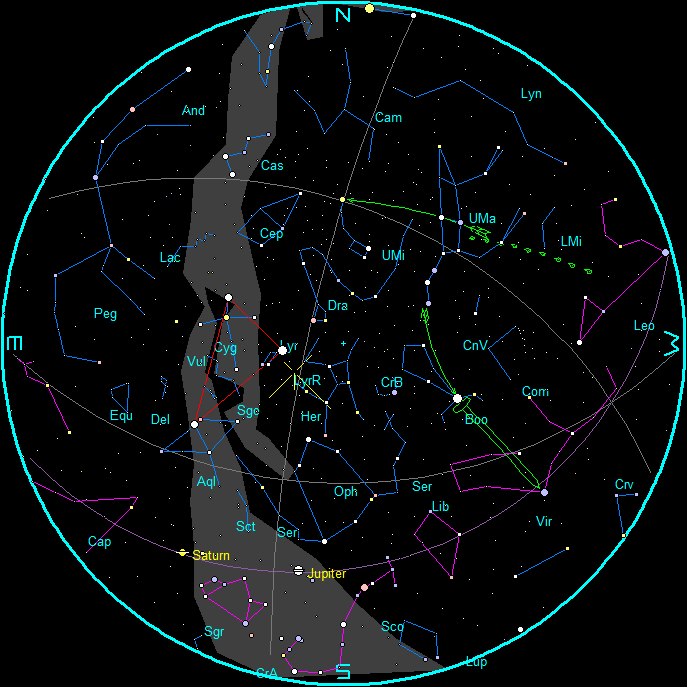 The chart contains the entire dome of the sky as seen from around 26 degrees south latitude at 2 hours after sunset on the 15th of the month. Planet positions are also plotted for the 15th of the month. The moon is not shown. The Magellanic Clouds, which are satellite galaxies of the Milky Way. The Large Magellanic Cloud is located in the constellation Dorado (Dor) the Flying Fish. The Small Magellanic Cloud is located in the constellation of Tucana (Tuc) the Toucan.